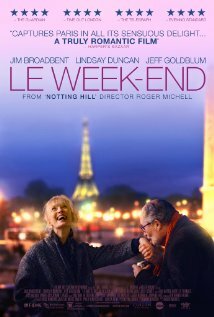 English couple, Meg and Nick, go to Paris for a weekend to celebrate their 30 year wedding anniversary. It’s a roller-coaster of emotions from the minute they get there – they run so hot and cold… “You can’t not love and hate the same person, usually within the space of five minutes…” says Nick. Meg and Nick seem to be at a crossroads in their relationship, in their lives. They alternate between domesticity and adventure, between love and hate, and Paris provides the backdrop for it all. I did quite enjoy this film, even though it was filled more with self-reflectiveness than comedy. It was a film about love, and about how to love with success and happiness really. It is a film for the more mature viewer, and for when that viewer is in a mood for a good narrative. McAdams plays Becky, a career-driven New Jersey TV producer. Her character is very similar to those hard working, quirky women that Katherine Heigl nearly always plays (see Knocked Up, The Ugly Truth, 27 Dresses, Life as We know it). I think this slightly neurotic, hard working, career woman is starting to be dished up onto our rom com plates a little too much these days. Anyway…Becky gets fired and moves to New York to take up a position on a failing morning show called “Daybreak”. It’s her job to rescue the show, but she’s up against the odds with difficult anchors and lots of competition from other stations. Her determination and drive makes her a success at work. But she’s failing at her new relationship with Adam (Wilson, from The Switch) because women can’t combine a career and a relationship. Or can they? I enjoyed this film more than a lot I’ve seen lately and it was probably because of Ford and Keaton. It’s a story of success, team work, and love. All feels good, worth a watch with your mum. Jason, much like Jen, is one of my favourite actors. I loved him in Hancock. He has matured so much since his eighties roles and developed a quirky, loveable, funny persona. And this is exactly his character in The Switch, with a bit of neurosis thrown in. He plays Wally and is best friends with Kassie, played by Jen. Kassie wants to have a baby and goes looking for a donor. As the name suggests, Wally switches the donor’s sperm with his own at the crucial time and nobody knows. You’re not sure what will happen with the ‘boy meets girl’ scenario as there is a child and a sperm donor involved. So it’s kind of nice that this film is not as predictable as most romantic comedies. But then again, it does end with a smooch, and the ol’ happy families. I don’t know why, but I wasn’t convinced that I could watch this movie again. But on second viewing, I did like it much better than the first time. Worth keeping in the back catalogue for a rainy day.